Ranjith and Mohanlal have worked on numerous films in the past and have been one of the most hit combinations in Malayalam cinema. The Complete Actor Mohanlal is a busy actor with handful of movies under his belt which are lined up for release this year and next year too. Mohanlal has now collaborated with director Ranjith who has been a close associate of the top star for many years. 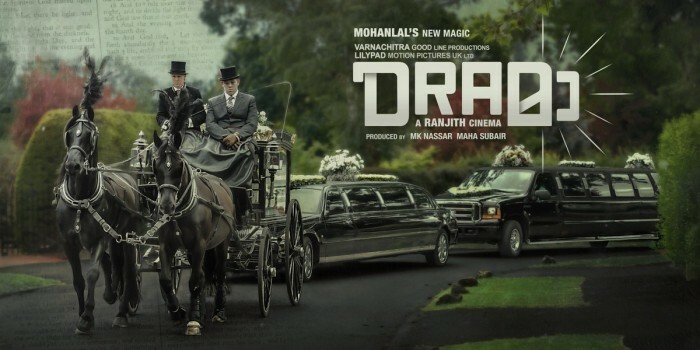 The film has been titled Drama and Mohanlal has now unveiled the title poster of the film today. The poster seems to create a lot of excitement and the plot seems to be set in the European city, London. Drama will be produced by MK Nassar and Maha Subhir under the banner Varnachitra Good Line Productions. The title poster also indicates that the film may have a period backdrop too. More details are awaited for and is expected to be released over the coming days. Ranjith and Mohanlal have worked on numerous films in the past and have been one of the most hit combinations in Malayalam cinema for many years. Mohanlal will also be seen in couple of few films – Odiyan, Neerali, Marakkar and Mahabharath. Odiyan is being directed by VA Shrikumar Menon and is a period drama which has Mohanlal playing the last surviving man of the Odiyan tribe in the Palakkad region. Odiyan will have Mohanlal sporting multiple looks, right from a younger Odiyan to an older one. Neerali is being directed by Ajoy Varma and will have Mohanlal playing the central character. Neerali is an intense thriller and will mark the reunion of Mohanlal with Nadia Moidu after almost three decades. Neerali also stars Parvatii Nair in a pivotal role. Marakkar is another period drama which has Mohanlal playing the Muslim Naval Officer named Kunjali Marakkar who was one of the most vigilant officers of that period. To be directed by Priyadarshan, Marakkar will be another period drama for Mohanlal.